Adrien Rabiot’s contract at Paris Saint-Germain will run out after the end of the season and it is no surprise the midfilder is on the radar of Barcelona and clubs in England. Friday’s edition of Catalan newspaper Mundo Deportivo takes a look at the 23-year-old’s situation and they claim the Spanish champions want to sign him, but Liverpool are also ‘interested’ in the player. Thomas Tuchel’s side want to tie down their star to a new contract but despite several attempts from PSG president Nasser Al-Khelaifi, the France international has turned down opportunities to sign an extension. The Blaugrana have no ‘illusions’ they are the favourites to sign the Ligue 1 star because the Camp Nou outfit are aware of ‘very powerful offers’ made for Rabiot by the Merseyside club. 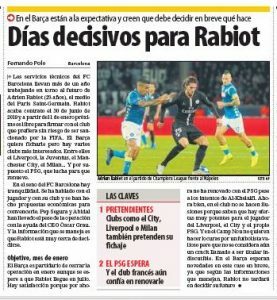 Barca view Liverpool as a ‘tough competition’ in the race to sign the midfielder. Liverpool’s summer signing Fabinho has struggled for minutes and he is currently ‘bored’ at Anfield, according to Le Parisien. The ex-AS Monaco man is on the radar of PSG and if he returns to France and takes Rabiot’s place in the squad, it could help the Reds clear place for the Frenchman. Amid interest from Barcelona and the Premier League side, the Frenchman is yet to make a decision on his future and the report claims he is ‘very close’ to doing so.